On behalf of your Elected officials I would like to wish all of you and your families a very happy Thanksgiving. I would like to take the time to thank the Executive Board and our Union Reps for their hard work and dedication. I know that at times it can seem like a thankless job. That is what makes all of you special. I know that pleasing everyone is an impossible task, yet all of you tread on. Thank you once again for all you do. I would like to also thank all of our members who choose to get involved and stay informed by attending our monthly union meetings. It is all of you who make our jobs worth while. I think we should all take some time and reflect on what we are grateful for. The opportunities and freedoms we enjoy in this great country are the direct result of so many who gave their lives. We owe all of them our eternal gratitude. With the hectic holiday season quickly approaching, please take some time and give thanks... I know I will. 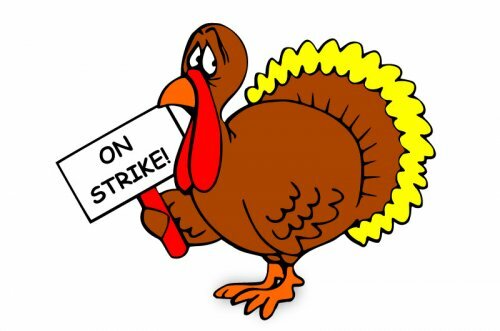 As you celebrate a festive Thanksgiving holiday with family, friends and the special people in your life, Labor 411 reminds you to be grateful for the employers who provide their employees with living wages and a great working environment. Consult our union-made Thanksgiving shopping list and you'll cook up an unforgettable feast and support good jobs at the same time. Click here to view the union-made shopping list.